A total of 180 persons attended the function - 97 male, 72 ladies and 11 children. More ex-employees joined the SAEEA and became members. Their families also met with their old friends. Syed Shahid Ali was nominated to act as Stage Secretary. He performed his job in a very professional manner. The function started after Maghreb prayer with the recitation of holly Quran, by Saeed Ahmed Khan. Kamal Ahmed Farooqi depicted a brief overview of SAEEA history from inception like: Formation of SAEEA on October 11, 2010 and its gradual growth as of today; Launching of SAEEA website from August 23, 2012; Publication of SAEEA news in Aramco ExPats Website and Al-Ayyam Al-Jamilah Annuitants Magazine; Audit of SAEEA Account is in progress; SAEEA by-laws are under review with a professional lawyer; SAEEA Registration request will be submitted to Government of Pakistan once SAEEA by-laws are finalized. SAEEA’s Website was constructed by a local company. The company representative, Mrs. Hooria delivered a very short brief about SAEEA Website. As a token of appreciation and remembrance, SAEEA presented a wall clock with SAEEA logo to Hooria. Mr. Farooqi also appreciated Mr. Munawwar s/o Ex-Aramcon Mr. Mahtab Saeed Khan, who initially helped SAEEA in construction of SAEEA website. Mr. Farooqi requested all SAEEA members to contribute the membership and yearly contribution as early as possible, and donors to come forward and strengthen the SAEEA financially. The two members, Mr. Atiqur Rhman of Karachi and Mr. Abdul Jabbar, USA, donated 5,000 each and were hailed by the attendees. SAEEA provided the opportunity to share views, suggestions, etc. and left an open floor for interested ex-employees. Few ex-employees shared their views. Kamal Farooqi made prayers for sick friends and forgiveness for those who are not with us anymore. Lucky Draw. Ten gifts were presented to attendees on ‘LUCKY DRAW’ basis. The food provided by the club was delicious and people liked it. 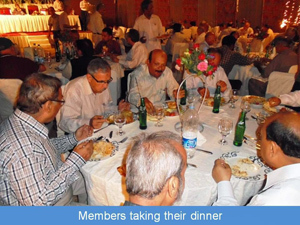 However, SAEEA will look for better and more delicious food in their next get together. The function place was in the center of the City; however, a few people faced problems because of heavy traffic and and the location was far away from their houses. SAEEA will look for a more convenient place. SAEEA tried its best to spread the news in person about the formation of SAEEA through land-line, sms, e-mails and now through website to all ex-Aramcons. Now, we expect those ex-employees who are not contactable so far, to come forward and join SAEEA to share their sweet memories of the past with their friends. The function adjourned on time, as planned. PHOTOGRAPHS TAKEN AT THE FUNCTION: Photographs for the 5th Reunion Function were covered by Mr. Shafiq Ahmed Khan and is son Shabil Ahmed Khan. Editing, captions and presentation completed by Ghulam Qutubuddin Khan. Enjoy photographs of the SAEEA 5th Reunion in the Aramco ExPats Gallery. View a PowerPoint presentation of the event SAEEA 5th Reunion Presentation.